ClubCoins Necesarios: 250 Please note that, for now, you cannot download content from our platform directly onto a mobile device (phone, iPod, iPad, tablets...). You need to download your items onto a PC or Mac, and then transfer them onto your device in the normal way. We are working on allowing direct downloads to mobile devices but this is not possible in the current version of the platform. Sorry about the inconvenience! Bring history back to life through Jim Hodges' historically accurate, exciting, and edifying audio recordings. Liberty or death-this was the choice the people of 14th century Scotland faced if they rose up against their English ruler. Most would say it was no choice at all. Many of the Scottish nobles were English supporters. Few could be expected to rise up against the numerically overwhelming En… glish army. The hero of the story, Archibald Forbes, joins the struggle for Scottish freedom led by the valiant Sir William Wallace and Robert the Bruce. The extraordinary valor and personal prowess of these men rival the deeds of the mythical heroes of chivalry. 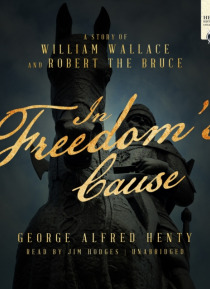 Henty weaves a wonderful story around the actual events of 1314 at Bannockburn.The Henty Historical Novel Collection, written by George Henty in the 1800s, covers many time periods in history throughout the world. In this collection, you will learn history, geography, and vocabulary while also discovering hero characters for your children to emulate. Study guides to enrich your learning experience are available at www.jimhodgesaudiobooks.com/product-category/study-guides.